Please refer to our stock # 11533 when inquiring. 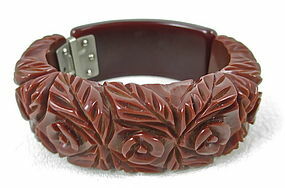 This lovely 7/8" wide vintage bracelet is hand crafted from brown bakelite and has a 6" interior measurement. The front is intricately carved with flowers and leaves, and the side has a tight hinge mechanism. It is in excellent condition and has been tested for bakelite.